Tallis, J & F 1851 - orig outline col. steel engraved map. 37 x 26 cm. From ?The Illustrated Atlas. ?, edited by R.M.Martin ; maps engraved by J.Rapkin; illustrations drawn and engraved by various artists; exc. cond.- This edition has NO centrefold which makes it more desirable for collectors and therefore, demands a slightly higher price than other publications! 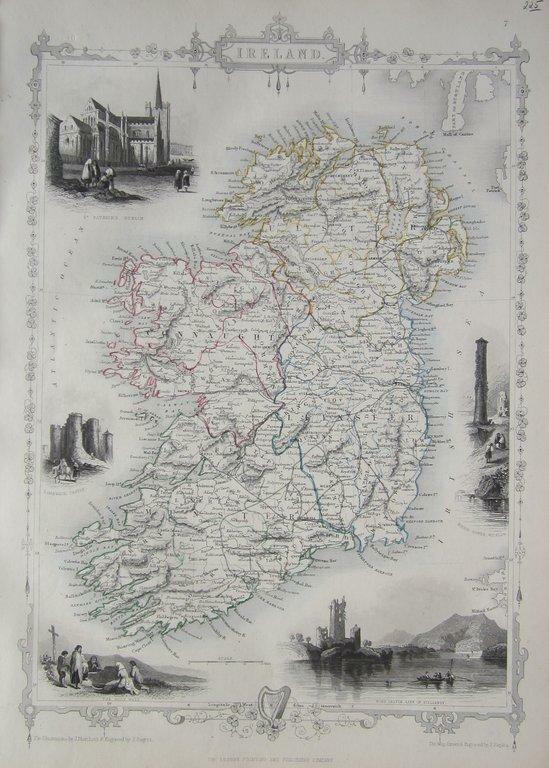 This map is from the last highly decorative atlas produced in the Victorian era. The map is surrounded by scroll work and depicting various vignettes, showing topographcal views, costumes and customs, and general scenes. In this map, we see: St. Patrick's, Dublin; Limerick Castle; The Holy Well; Ross Castle, Lake Killarney; Round Tower, Wicklow.